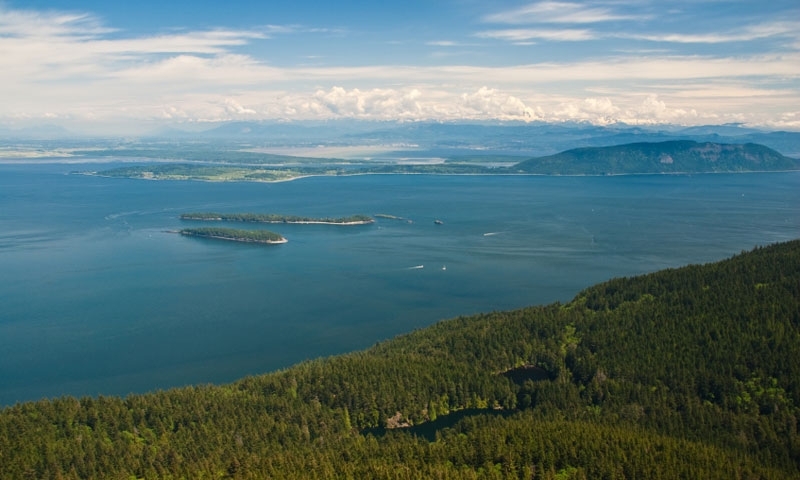 Mount Constitution is the highest point in the San Juan Islands. The views from the peak are therefore unbeatable. You can hike or drive to the top, some brave souls even bike. Drive or hike to the top of Mt. Constitution for stunning views of the islands and surrounding mountains. The ancient forests and lakes around the Mountain are fun to explore. Swim, hike, and camp right at the base of majestic Mt. Constitution. What can I see and do at Mount Constitution? Mt. Constitution offers beautiful trails, amazing views and nearby camping. Surrounded by Moran State Park the Mountain is an outdoor paradise with a surprisingly alpine feel. Choose between hikes up the mountain or around the lakes and streams at its base. Refresh yourself with a swim in Cascade Lake after a long summer hike. Mt. Constitution is on the east side of Orcas Island in the center of Moran State Park. To reach Moran State Park from Eastsound head out of town on Olga Road and it will lead you right into the Park. Once in the park look for signs that will direct you to the road and trails to the top of the Mountain. When is Mount Constitution open? The Park is open year round for camping and hiking. The trails are open for daytime use only. How much does Mount Constitution cost? If you park in Moran State Park you need to have a Discover Pass attached to your vehicle. This Pass can be purchased for $10.00 for the day or $30.00 for the year. If you are camping your fee includes a vehicle pass for the duration of your stay.